Welcoming a kitten into your home is a lovely experience, but the decision to become a pet parent is not one to be taken lightly. Even the smallest, cutest kitten will be life-changing, so it is important that you’ve thought long and hard about the decision. Before the 8-week stage when you bring your kitten home, he/she should have already started being socialised and litter trained. First vaccinations should also have been given at 6-8 weeks, and the course will need to be followed up once you’ve brought your kitten home. Worming should also have been done at the 6-week stage, and ideally this needs repeating every two weeks until 16 weeks old, as roundworms are very prevalent in kittens. TermaWorm can be given from six weeks of age providing kittens are over 1kg and is an effective treatment against all common roundworm and tapeworm found in the UK. Most kittens will learn how to use the litter tray from their mothers, but you can help reinforce this training by placing the litter tray/box away from the food bowls and in a quiet and private location. Make sure you have all the essentials for welcoming your new kitten home, including food bowls, litter, scratching posts, toys, grooming tools and a cat carrier. Cats will sleep anywhere, but providing a soft, cosy bed for them to curl up in will help them feel more relaxed and at home. Discuss what food your kitten has been given up to this point and whether it should be continued. When you’ve brought your kitten home, you’ll need to take things slowly and establish a routine. Your kitten is going to be nervous at first, so it’s important that you spend lots of time together so they learn to trust you and get used to being handled. Socialisation with other people, including children, as well as other fully vaccinated cats and dogs will also be helpful as your kitten grows. If you’re introducing your kitten to other cats in the household, make sure you do so gradually to avoid any territorial behaviours. As well as getting your kitten used to being handled, try and get them accustomed to having their ears and teeth checked too, as this is something you’ll need to keep an eye on throughout their lives. RestAural is a gentle everyday ear cleaner that can help maintain healthy ears by drying, cleaning and balancing the ear canal, reducing the chance of infection. We also have an own brand oral hygiene paste, OraFresh, which is formulated to help maintain healthy teeth and gums and can be administered on a paw for your kitten to lick off. If you start using this early on, your cat should have no qualms taking it in the future. As soon as your kitten is home, get them registered with a vet and think about pet insurance. The sooner you take out pet insurance the better, as many providers won’t offer it past a certain age. From 12 weeks onwards, start to think about neutering. Not only will it help safeguard your cat from serious diseases in the future, it will go towards helping reduce the number of unwanted cats that end up in shelters. Speak to your vet about your options and the pros and cons of the procedure. As your kitten ages, you will also need to think about changing dietary needs and how you can ensure you are providing the most nutritionally beneficial diet for your cat's life stage. 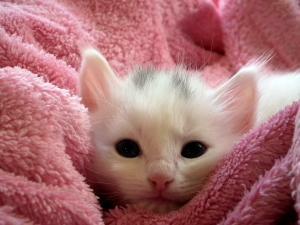 If you have any advice of your own on caring for a kitten, please comment below and share it with our other readers!